Krow is a large Mini-Necky boss and King K. Rool's "eye in the sky" encountered in Donkey Kong Country 2: Diddy's Kong Quest and Donkey Kong Land 2. He is fought in the level Krow's Nest in both games. His ghost, Kreepy Krow, later returns as the boss of Gloomy Gulch. After Diddy and Dixie Kong venture through the Gangplank Galleon, they reach the ship's crow's nest, where they encounter Krow. Krow's most commonly used tactic is to pick up one of his eggs and hurl it at Diddy and Dixie. He will also ram into his nest to make eggs fall from it. The Kongs can grab one of the eggs that Krow throws once it stops bouncing and throw it back at him to attack. After being hit multiple times, Krow will become disoriented and begin to bash into his nest, flinging eggs everywhere. Diddy and Dixie must avoid these falling eggs and grab the ones that hit the ground and stop bouncing and hurl them at Krow, who becomes even more erratic. After being hit by a few more eggs, Krow will collapse, surrender the Kremkoin he was guarding, and die (as seen in the Game Boy Advance remake, where his spirit leaves him and floats away); the Kongs will then later fight his ghost in Gloomy Gulch. 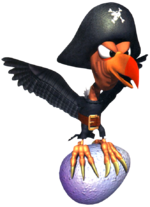 Krow reappears in Donkey Kong Land 2, reprising his role as the boss of Gangplank Galleon, but with a few differences in his battle style. At the start of the fight, he flies up to his nest and grabs an egg and swoops down at the Kongs, then releases the egg he is holding. Like in Donkey Kong Country 2, Diddy and Dixie can pick up the egg and throw it at Krow to attack him. After Krow's first hit, Krow attempts to fly up to his nest and repeats the step where he flies up to his nest, grabs an egg, swoops at the Kongs, then tries to attack the Kongs with the egg. The Kongs must once again throw the egg at Krow to damage him. Then, Krow follows the Kongs where they walk from up above to release eggs from his nest at the Kongs. The spinning eggs do not fall on the ground properly, but ones that fall straight down hit the ground so that the Kongs can use the egg as a weapon against Krow. When the Kongs hit Krow after he repeats this step again, Krow loses the battle and leaves behind a Kremkoin. The Kongs can then move on to Krem Cauldron. Like in Donkey Kong Country 2, Krow returns in Gloomy Gulch as Kreepy Krow. In this game, Kreepy Krow's appearance is identical to that of his mortal self. Krow is a black Mini-Necky. He has a red beak with beady black eyes. Like most pirates, Krow has a black tricorn hat with a skull on it. He also has a brown belt with a gold buckle around his body. Krow also appears with three yellow claws on each of his talons. Despite Krow's name being a word play on the animal "crow", Krow seems to be more related to vultures rather than actual crows. Zokkī Zocky, based on Necky. Krow is the only boss (besides King K. Rool and KAOS) in the entire Donkey Kong Country series to be fought more than once in the same game. This page was last edited on March 28, 2019, at 12:56.